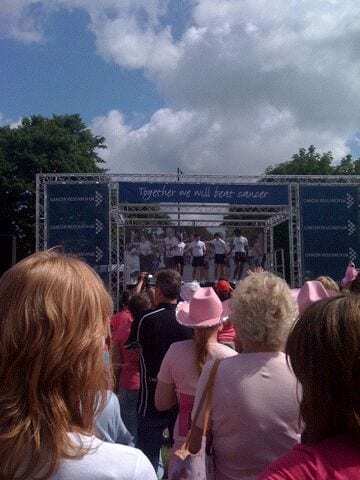 As you probably have guessed by now, I managed not to die from doing the Race for Life recently. I woke early, to make sure I was on the Downs for 10am, but managed to get there even earlier. Getting up at 8am on a Saturday to go running seems wrong. Decorate my back sign! 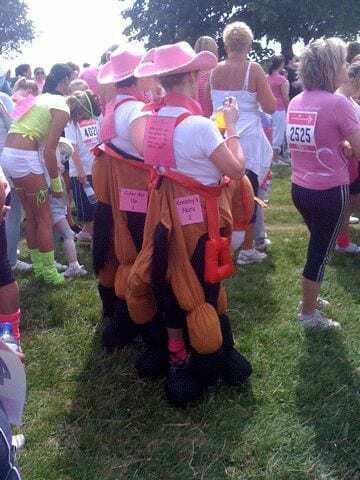 The back sign is quite an important thing for Race for Life, where you say why you are running/walking/hopping/doing the worm. Here I am with my back sign, dedicated of course, to my Mum. One of my favourite fancy dress outfits! There was a lot of neon outfits worn, as well as a surprising amount of people wearing jeans and a t-shirt. I was dressed in joggers and a (Howies, of course) t-shirt. 0 – 1 KM: Hey, this is pretty easy. I’m glad this is on the roady part of the Downs. 2 – 3 KM: Ooh, starting to get a bit more difficult, but still running. 4 – 5 KM: Still in a lot of pain, trying to take Ibuprofen while walking, but managed to run the last half kilometre because there was no way I was walking over the finish line! Holding my medal for finishing the race! I’m really pleased I did it, and happy that I managed to run most of it. If you would like to sponsor me still, the webpage is open until August, and that can be found at http://www.raceforlifesponsorme.org/hayley_c. Thank you so so much to everyone who has sponsored me so far as well! Whoo hoo, go you!!! Looking forward to doing it next year, Tillos for a celebratory milkshake me thinks! Congratulations on this. Its such a great thing you did.